Wild: When someone asks me what the fastest creatures on the island are, Gallimimus is always a contender. 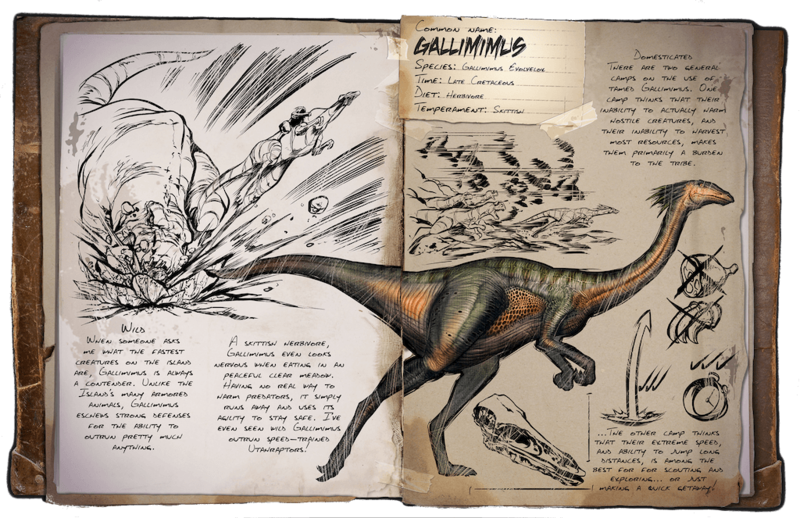 Unlike the island’s many armored animals, Gallimimuses chews strong defenses for the ability to outrun pretty much anything. Domesticated: There are two general camps on the use of tamed Gallimimus. One camp thinks that their inability to actually harm hostile creatures, and their inability to harvest most resources, makes them primarily a burden to the tribe. The other camp thinks that their extreme speed and ability to jump long distances is among the best for scouting and exploring… or just making a quick getaway! Known Information: A skittish herbivore, Gallimimus even looks nervous when eating in a peaceful clear meadow. Having no real way to harm predators, it simply runs away and uses its ability to stay safe. I’ve even seen wild Gallimimus outrun speed-trained Utahraptors!